When I moved to Fukuoka, I had no idea at the time that it was the prefecture arguably known to have the best ramen in Japan. 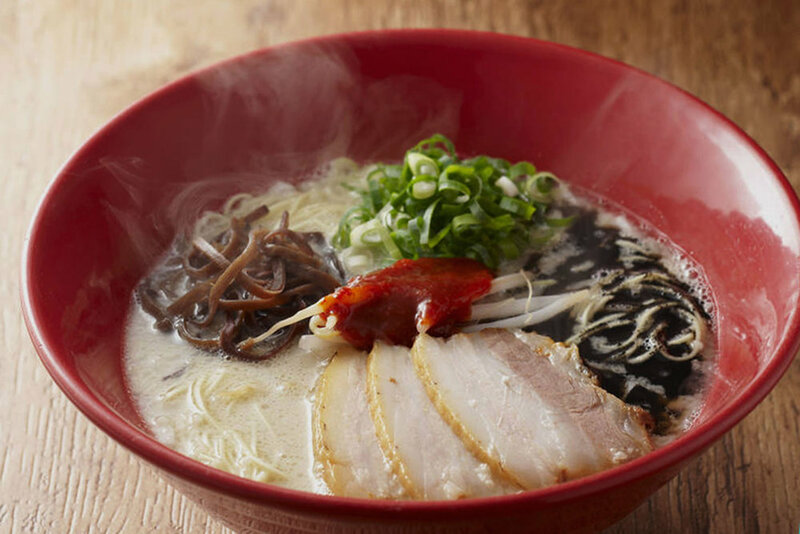 Much of the ramen that has dominated the global boom is Hakata’s ramen, named after the main area of Fukuoka, and known for its tonkotsu (pork) broth and thin, firm noodles. Ichiran is the king of Hakata ramen, and its fame is well deserved. Each bowl of ramen is custom made to your taste, and you can enjoy it in your semi-private counter cubby. In my opinion, they have the best noodles (get it Fukuoka style: “Barikata” or very firm), and their broth is always rich in flavor. One difference in some of Fukuoka's locations is the signature rectangle box bowl. This is how it's served in locations like Tenjin's Nishidori. My personal favorite ramen shop in Yukuhashi and one of my favorites in all of Fukuoka. It may not be the most famous in town, that award goes to the now international Kanada-ya, but Marushin’s ramen has a perfectly balanced and tasty tonkotsu pork broth that's just the right amount of rich. Their "Akamaru" is fantastic and has a little bit of Korean gojchujan spiciness to it. Each bowl is full of toppings and all in all amazing, and they're open until 2AM for those late nights. Ippudo is one of the most globally known Hakata ramen chains with locations in 13+ countries outside of Japan. Each bowl is hearty, with a rich, smooth broth, nice pork slices and perhaps the thinnest noodles I’ve had in Hakata ramen. Their “Akamaru” is my favorite due to its added spiciness, but two of the best things about Ippudo are their Hakata-style, bite-sized gyoza and all-you-can-eat flavored bean sprout sides free for the taking on the table. The most famous “local” ramen spot in Fukuoka city. The original location, a hole-in-the wall in the Tenjin area’s backstreets, has walls covered in signed cards and posters from Japanese celebrities. Shin Shin’s broth is just slightly lighter than some of my other favorite ramen spots but with no sacrifice in taste, and their noodles are pretty similar to Ichiran’s. They have a few more locations beside Tenjin’s with two conveniently located in Hakata station. A simple yet tasty bowl, Danbo was the first ramen to really make me think about whether or not to go to Ichiran. Originally from the Chikushino area of Fukuoka, they now have locations around Japan and abroad as well in places like Vancouver, Seattle, NYC, Australia and Vietnam. Their broth’s flavor is a tiny bit thinner than Ichiran’s but their noodles are quite similar. Each bowl has some great melt-in-your-mouth slices in it. A couple other ramen shops that I recommend in Fukuoka are Taiho [J] and Ramen Kurume Honda [J]. Both are from the Kurume area of Fukuoka and serve some hearty bowls of ramen with fantastic slices of pork. Next time. By no means is this a comprehensive list, there are endless good bowls of ramen in Fukuoka and everyone knows you can’t get enough. So if you have a Hakata ramen recommendation, please write it below!